The first half of September has been pretty busy in Loweswater. First there was the Show, if you want to get the feel of it check out Roger and Ann Hiley’s website. And on the Friday we were on Fangs Brow which was part of the King of the Mountains challenge. 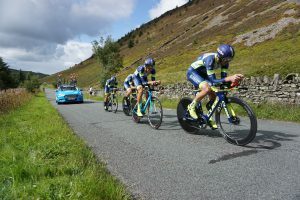 Here are Geraint Thomas, Wout Poels and Chris Froome from Team Skye powering their way up the hill. It has started to feel quite autumnal in the past couple of weeks, the swallows and house martins have been gathering, probably on their way south from further north. 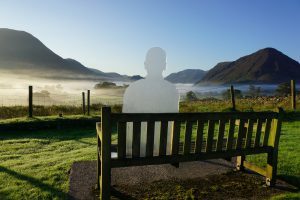 There have been some beautiful misty mornings and I was very pleased with some photos I took of my WW1 silhouette on the bench at the front of Foulsyke. I wasn’t so pleased when I went back into the house and found Peggy, the cat, was on the table eating my breakfast! 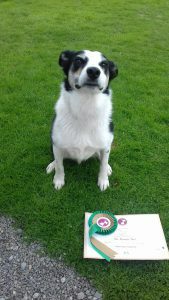 Keeping with the animals, Max, much to everyone’s surprise, achieved his Bronze Obedience Award a couple of weeks ago. 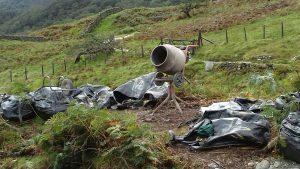 It’s not very often you see a cement mixer on the fells – I saw this one today on the Miners Path near Castle Crag.